Polaris’ largest selling side by sides are their XP 900 and 1000 full size crew cabs. These UTVs offer more seating and storage space than a standard cab, and are capable of going to many of the same places. We have selected a number of quality manufacturers of Polaris Ranger Crew accessories to ensure that all your needs for comfortable, safe and reliable vehicle operation of these poplar models are fulfilled. Whether you are looking for Polaris Ranger XP 900 accessories or want to upgrade any of the Ranger Crew 1000 models we have an extended selection of products for any application. At WhoMoto.com, you can find a wide variety of quality Polaris Ranger Crew XP570, 900, and 1000 aftermarket accessories for your full size Ranger Crew cab. Aftermarket XP570, 900, and 1000 one piece aluminum crew roofs, windows, and more from top notch manufacturers will ensure that your Ranger is ready to conquer whatever lies ahead. Sold 2 per pack. Holds objects 1 inch to 2 1/4 inches in diameter. Each clamp supports a safe working load of 25 lbs. 2 clamps support 50 lbs. Easliy add a license plate to the front of your Ranger. Add these folding mirrors for extra safety without the added width. Add up to a 4500 lb winch to your full size Ranger with this mounting plate made by Extreme Metal Products. Add up to a 4000 lb winch to your ranger with this rear mount winch plate by Extreme Metal Products. Use these grips to easily attach a variety of items to your Polaris Ranger. This mount allows you to mount Kolpin Gun Boot IV and 6.0 cases the bed of your Ranger. Use these dirt stoppers to make clean up easier after a muddy ride and prevent debris from getting under your seat area. Super easy installation! Easy to install 3 panel rear view mirror kit by SuperATV. Works with any Ranger with the Pro Fit style roll cages. Durable all aluminum housing, customizable colors, and fitment on almost any UTV make this a great side view mirror for anyone! This rack allows you to mount up to two guns over head in your XP570, 900, or 1000 Polaris Ranger. Simple and easy to install half windshield made by Kolpin. Comes with all hardware, no drilling required! Add this 3/16" thick aluminum to the bottom of your Ranger for increased protection from rocks, sticks, and other debris. 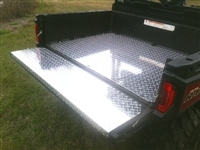 Add some function to the bed of your full size Ranger with this diamond plate cargo box. Add extra protection to the back of your Ranger with this heavy duty bumper made by Extreme Metal Products. Rugged and simple light kits specifically designed for the Deep South shallow taper roof. These floorboards for the Polaris Ranger XP570, 900, and 1000 Crew Cab are made of 1/8" diamond plate aluminum and powder coated matte black. Prevent sticks from breaking through your Ranger with this easy to install kit! Great all around winch, comes with mount kit made specifically for the Ranger 900, XP570, and 1000. This 3 inch lift kit by SuperATV includes easy to follow instructions and allows up to 28.5 inch tires to be installed. 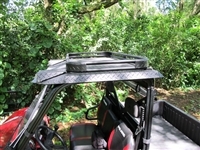 A very strong, low profile roof rack to fit your 570 or 900 standard cab Ranger. 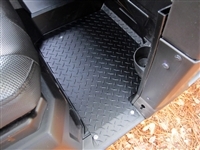 Add footwell protection and help to keep the plastic on the edge of your Crew Ranger from being damaged. This 1/4" surface hardened, half window for the Polaris Ranger XP570, 900, and 1000 full size is a great option for those who are looking for an affordable, basic window. Easy to install and fully trailerable. This rear speaker box is specifically built for the Deep South diamondplate roof and fits both the standard and crew cabs. The speakers are Pioneer 6 x 9 shallow mount speakers. Easily removable rear window that goes up, down or off with no tools. Also a big aid in lessening the dust. This Polaris Ranger surface hardened poly rear window installs in minutes and is easily removable! Braced with 1/8" aluminum for superior rigidity. Have heavy or jagged items that you don’t want damaging your new Ranger? Here’s the cure. Get the best winch out there for your Polaris Ranger Full Size with the Viper Wide Spool series made by MotoAlliance. © Copyright, Who Industries, LLC. All Rights Reserved. Online store by Volusion.